Informationen: "eBook - Requirements and Methods for VAH certification of chemical disinfection procedures"
Detailed description of the laboratory tests and methodology for efficacy testing of products and procedures for routine hand, skin, surface, instrument, and textile disinfection. Requirements for certification and listing of disinfectants in the VAH List of Disinfectants for bactericidal, yeasticidal, tuberculocidal, mycobactericidal, fungicidal and virucidal activity spectrum. These up-to-date test methods and requirements replace the DGHM methods and requirements of 2001 and 2002, respectively. Amendments will be made available online. 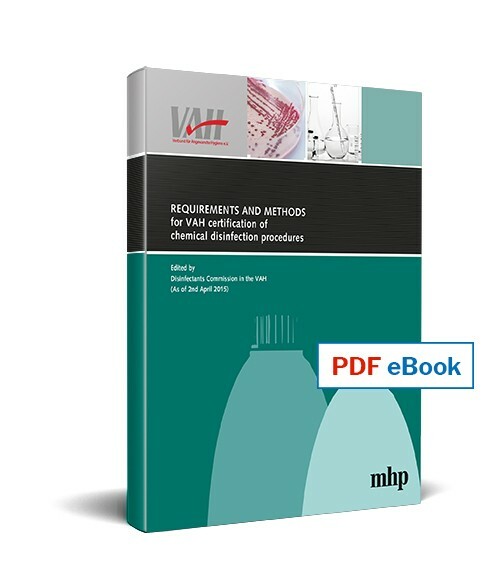 Weiterführende Links zu "eBook - Requirements and Methods for VAH certification of chemical disinfection procedures"